The Kennedy Space Center is a sprawling complex located on Merrit Island in Florida. While much of it, like the Visitor’s Complex, is open to the public, there are checkpoints barring access along most roads in. 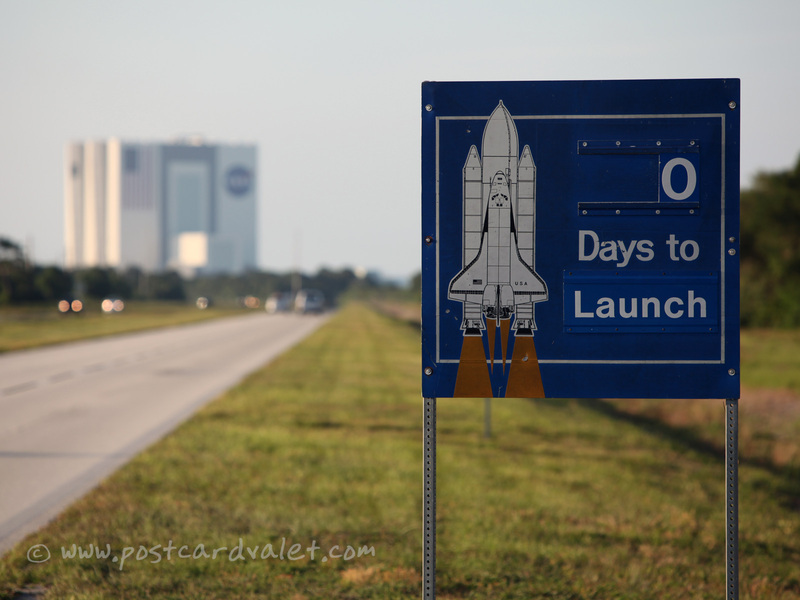 Security is tight near launch dates and while you may be able to book a bus tour to certain destinations inside, you can’t just drive onto NASA territory without a badge. I flashed my Tweetup badge, the security guard said, “Thanks, boss!” and I drove right through. Felt like a VIP. 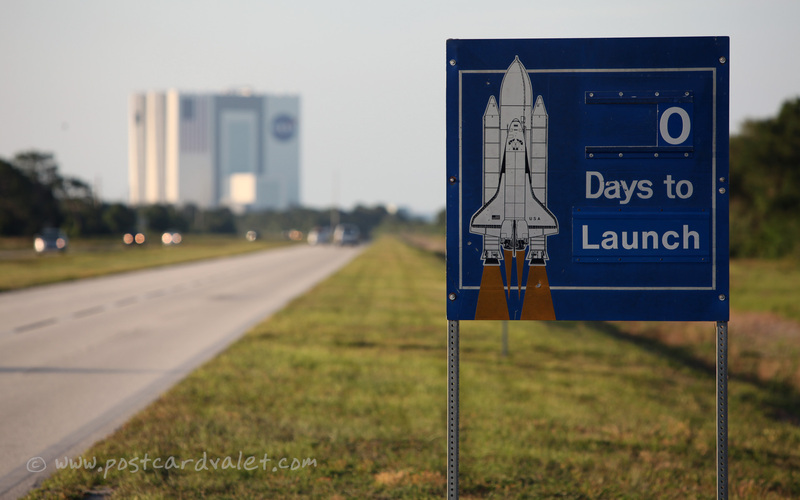 In fact, I passed a couple such signs, and they got me thinking about what an undertaking a Shuttle launch must be. That close to launch there must be hundreds, if not thousands, of NASA employees and contractors working very hard to insure that everything goes off without a hitch. I didn’t see them along the roadway, of course; they were all tucked away in the administrative buildings, the labs, at the launch pad, in mission control. I loved the idea of those signs along the road, someone dutifully changing their little numbers every evening. It spoke of morale. Of teamwork on an epic scale. I resolved to get a photo before I left. That evening, after a day full of events and tours, I found myself driving back along the same route. Traffic was light, and it was easy to spot the sign on the other side of the road. As if it was meant to be, a gravel strip across the median appeared right beside it. I pulled a U-turn, parked the rental on the grass and grabbed my camera. Surprisingly, someone had already switched the “1” to a “0.” Another reminder that, in just 20 hours, Atlantis would be leaving the Earth. I took a few pictures, trying to find the best framing with the VAB behind, but I was in a hurry. Badge or no badge, I felt self-conscious taking pictures of a government installation from the side of the road. Two minutes later, I was back on the road to Orlando. Tomorrow was Launch Day. Cool, I was there too at the STS 132! Awesome website and great stories.